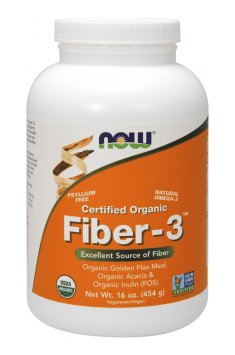 Now Foods Fiber-3 is a unique blend improving the functions of the digestive system. It consists of three synergistically acting components: golden flax seeds, acacia gum and inulin. These are an excellent source of fibre, support the digestive system functions, regulate stool frequency and stimulate the growth of intestinal microflora. The supplement acts very smoothly and can be used even by people with sensitive digestive systems. It does not contain psyllium, which is a popular source of dietary fibre, whose action sometimes turns out to be too aggressive for people suffering from digestive system disorders. Acacia Fiber (acacia gum, gum arabic) comes from the tree resin of Acacia seyal and Acacia senegal. It provides a soluble dietary fibre; after mixing with water, it creates a gel-like consistency and is metabolised by bacteria in colon. Compared with other sources of fibre, acacia gum has a very high food tolerance. It undergoes a slightly fermentation, so that its effect is mild and the risk of gas or bloating is low. Acacia fibre contains many valuable ingredients (oligosaccharides, polysaccharides, glycoproteins, arabinogalactans) of proven health promoting properties. Inulin is a polysaccharide from the group of fructans, naturally occurring in certain plants (chicory, sunroot, dandelion). It is consumed mostly in its pure form, extracted from plants. Due to the chemical structure of glycosidic bond, inulin is resistant to digestive enzymes present in the intestines. In the lower part of the digestive tract, inulin undergoes fermentation and provides a breeding ground for the population of Bifidobacteria in the large intestine. Flax fibre, or popular linseed, is produced from milled flax seeds. They are an excellent source of dietary fibre and contain a variety of health promoting ingredients. In the flax seeds we will find: essential fatty acids (EFAs), flavonoids, vitamin E, antioxidants, phytosterols and unique polyphenols (lignans). One of the biggest advantages of the use of the product is the improvement in the digestive system functions and restoration of proper stool frequency. The ingredients contained in the product are a source of fibre, a substance which cannot digested. Fibre absorbs water and forms a jelly-like consistency, which moves through the digestive tracts. It increases the stool volume, gives it the appropriate slip and makes it easier to expel from the body system. Moreover, inulin stimulates the contractility of intestinal walls, so that it regulates stool frequency. Supplementing the diet in good quality fibre prevents constipation and relieves pain related to haemorrhoids. The supplement can be used also in the case of diarrhea, as its ingredients absorb excessive water from the intestinal mass and restore the proper stool consistency. Inulin and acacia fibre present in the supplement show proven prebiotic and bifidogenic properties. They provide an excellent breeding ground for beneficial intestinal bacteria, especially from the Bifidobakterium and Lactobacillus species. They stimulate their growth and development, thus limiting the amount of adverse bacterial strains. Intestinal bacterial flora affects the functioning of the whole body system, not only of the digestive system. Its proper composition protects the body system against pathogens and determines the proper functioning of the immune system (up to 80% of the immune system cells develops in the lymphoid tissue of the digestive tract, with which the intestinal microflora closely interacts). Intestinal bacteria contribute to an increase in the bioavailability of certain minerals, such as magnesium, calcium, zinc and iron. They synthesize also many B-vitamins and vitamin K.
Much is being said about the relationship between intestinal dysfunctions and depressive and anxiety disorders. Numerous studies show that the balance of the intestinal flora may result in an improvement in mental well-being. Supplementing diet in fibre is an important element in the prevention of diabetes and cardiovascular diseases. Inulin, acacia fibre and flax seeds have a very positive influence on the blood lipid fractions. Polysaccharides reduce the levels of low density lipoproteins (LDL) and triglycerides as well as increase the levels of beneficial HDL. They also reduce the absorption of cholesterol in the small intestine. Alpha-linolenic acid contained in flax seeds also prevents platelet adhesion and aggregation. This makes the supplement can prevent atherosclerosis and cardiovascular diseases. Research indicates the correlation between consumption of adequate amounts of dietary fibre and the development of diabetes, especially type 2. Inulin and acacia fibre have hypoglycaemic properties. They help to maintain stable blood glucose levels, mainly by slowing down the absorption of sugars. The supplement is an invaluable help for people struggling with unnecessary pounds. The ingredients are highly hydrophilic; they easily bind water and swell in the stomach, giving a feeling of fullness. They effectively inhibit appetite and make you feel full for a long time, so it is possible to limit the amount of food you eat without feeling hungry. Fibre also absorbs part of the fat from food, which naturally reduces the amount of assimilated calories and leads to weight loss. Fiber-3 is the best source of dietary fibre. Including it in your diet can help to improve the functioning of the entire body system and is an essential element for the prevention of metabolic disorders. The product contains only natural ingredients, which are well known for its efficient but very mild action. Mix 2 1/2 tablespoons into at least 12 oz. of water or juice, and blend. Be sure to drink plenty of additional fluids throughout the day. Start with smaller amount and gradually increase to full serving size over several weeks. Use once or twice daily for optimal effect. According to American specialists, the recommended daily intake of fiber is from 25 g/day for women to 38 g/day for men. It is assumed that the dose of 25 g of fiber can have a beneficial impact on maintaining normal body weight and enhances the protection from diet-related diseases. To ensure the optimal action of fiber, it is suggested to drink at least 2 litres of fluids per day. It is recommended to consume fiber 15-30 minutes before a meal. Since fiber can reduce the absorption rate of some drugs, it is suggested to take them one or two hours before fiber intake.